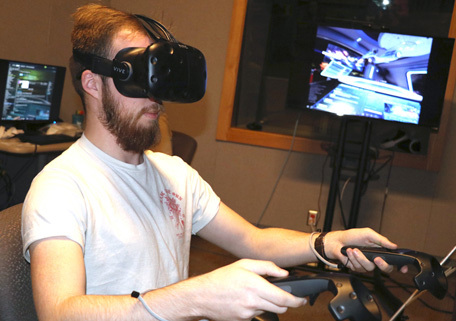 MTSU student Nathaniel Hobbs plays a game called “Star Trek Bridge Crew.” The game harnesses virtual reality to allow players to better understand how genders are represented. But a new field of study at Middle Tennessee State University is harnessing an emerging technology to help people understand each other better. The program, offered through the College of Media and Entertainment, trains students in fields such as virtual and augmented reality, game theory, social media and user design and experience. It is designed to prepare students for careers in a rapidly evolving area that has attracted heavy investment by venture capitalists and is just beginning to show its transformative potential in commercial applications. Students in the interactive media program learn to write screenplays, direct actors, shoot video and code in Unity, a software platform that turns the content into the world that viewers experience in VR. The program is a multi-disciplinary effort involving all of the college’s departments and a total of 18 different classes. MTSU Recording Industry Professor John Merchant helps media arts Professor Stephanie Dean adjust her virtual reality headset. 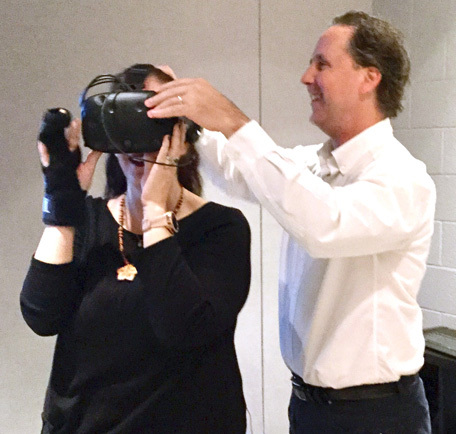 The two professors have collaborated on the Immersive Storytelling Lab, which allows students to create compelling content for VR technology. The project is co-led by Dean, a professor of media arts who teaches 360-degree video filming and screenwriting, and Merchant, a recording instructor and music producer who was once chief engineer at the Bee Gees’ Miami studio. “We’re not capable here of building better optics or headsets, but what we can do is take those tools and create better experiences,” Merchant points out. Jim Gault, chief deputy of the all-volunteer Waldens Ridge Emergency Service, wears a virtual reality headset to train on computer simulations of firefighting scenarios. With him is UT Chattanooga student Dax Ledesma who coded the simulations. From that meeting, MTSU’s Immersive Storytelling Lab was born. It’s an experimental space equipped with high-end PCs for film editing and coding, VR headsets, film equipment, and even a treadmill for learning how to walk in a virtual world. It’s a place where students and faculty explore how to tell stories through a new technology that is still in its infancy. It’s also the next step in media. Outlets like the New York Times and USA Today are already developing VR content for journalistic coverage. They anticipate the technology will go mainstream as VR headsets become smaller, lighter, cheaper and more widely used and more content is optimized for smart phones. 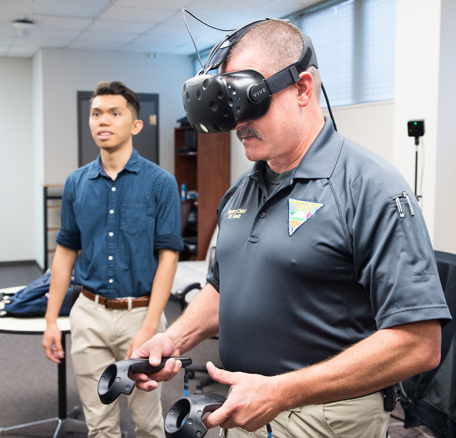 And at the University of Tennessee at Chattanooga, students in the Department of Computer Science are developing virtual reality programs that will one day help train firefighters for real-world fires. Students visit fire stations to learn about variables that can affect a fire’s burn rate, such as temperature, wind and chemicals in the environment, and build hazards that firefighters might face. Understanding those real-world conditions helps the students create better simulations. That could potentially cut the cost of training for fire departments by reducing the number of expensive live fire exercises they have to stage. VR has plenty of fun uses, too, from gaming – Dean is faculty advisor for an e-sports club that has 500 members – to virtual travel. Some schools are beginning to incorporate VR in their curricula, allowing students to explore under water, take field trips to another country, go back in time for history lessons, and even meet other students around the world through social platforms that allow VR users to connect in virtual worlds. And when Dean’s father was bed-bound in hospice this past summer, he expressed the wish to visit the Smoky Mountains. He was able to do so – virtually – by watching 360-degree videos uploaded on YouTube through a set of cardboard VR goggles. One issue with virtual reality is scalability. Currently the headsets used to experience VR are large, unwieldy and tethered by a cord. Those cords can take the viewer out of the experience. But the next generation of headsets are smaller, lighter, cheaper and wireless. And as the technology evolves, content eventually will migrate to the smartphone, making it available to a broader audience.